Mujitsu and Tairaku's Shakuhachi BBQ / Kurebara Seigaku? Does anybody know anything about this late Edo-early Meiji Myoan player and maker? Anybody know who Sorest is? "Sorest" would be a really weird name for a 19th-century Japanese person to have, unless it's an idiosyncratic romanization of "Soresuto" or something (but even that would still be a really weird name for a Japanese person to have). I talked to John, he misspelled it in the email. It's Soetsu. Here's the Kurebara 2.0 with weird grafted root and huge holes. 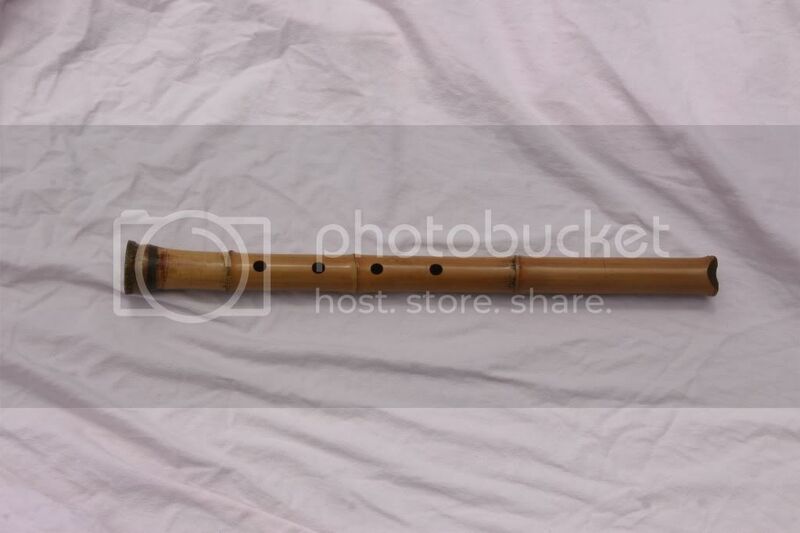 Very nice flute. I've played it. Perfect for Myoan and probably good for Nezasa Ha, though you'd have to ask John. What is the asking price for it, Brian? Still $4K? Edit: Duh, I forgot who the thread was actually supposed to be about. I could also ask myself if it's good for Nezasaha and answer, "yes." Not for sale anymore because I traded my other Myoan 2.0 to John for a 2.3 so this has moved up the 2.0 batting order. Thanks for the links No-Sword. Fascinating how the Myoan, gaikyoku, and Tozan are all so closely related. Defies our current convenient pigeon-holing of those styles.